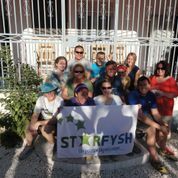 Starfysh was just paid a visit by a high energy group from Berkley Hills Community Church in Grand Rapids, Michigan. They came to visit and work among the people in the village of Makochon, a remote mountain village that, about one year ago, captured the hearts of the Berkley Hills congregation back home. One direct result of their commitment to make a difference there has been the opening of Ecole Merveilleuse Lumier, Wonderful Light School, a K-3 elementary school…Makochon’s very first school.